I love the Pancake Day / Shrove Tuesday tradition we Brits have. Shrove Tuesday is the last day before the Christian period of Lent begins. Traditionally during Lent, Christians would give up certain foods until Easter Sunday. 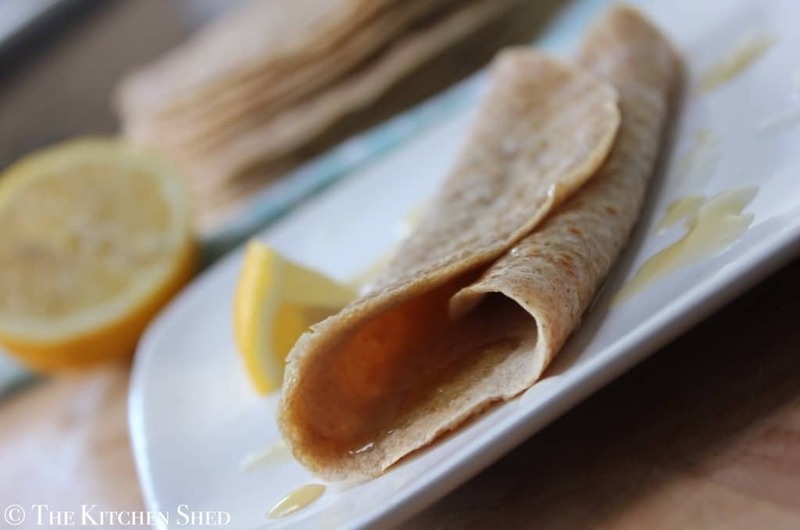 Pancakes were eaten on Shrove Tuesday as a final celebratory meal because they contained eggs and butter/fat which were not consumed during Lent. Pancake Day is so much fun for the kids. I can remember how overly excited I got before taking my turn at flipping a pancake. My topping of choice was always lemon and sugar but the rest of the family filled there’s with cherry pie filling and squirty cream. (I wasn’t such a fan of that). 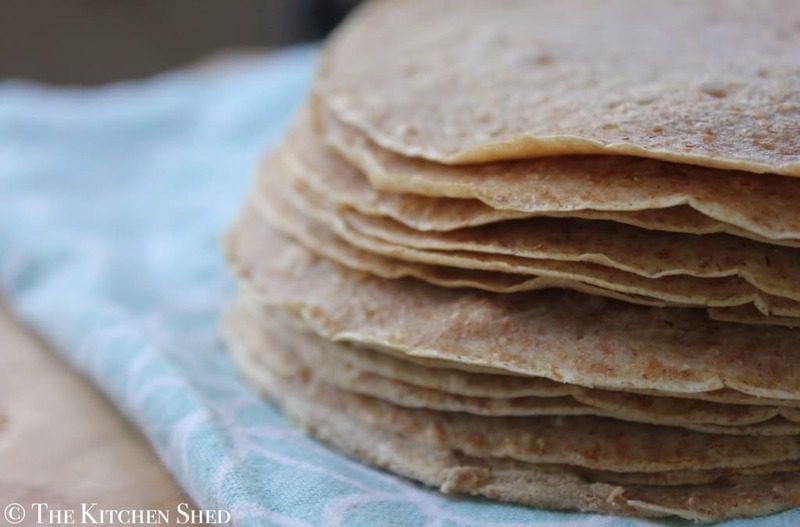 These Clean Eating English Pancakes taste so much like traditional English pancakes (made with white flour) that they would be an easy substitution to make for anyone new to clean eating. And who needs sugar when you can have honey? Seriously, these are brilliant and will satisfy even the fussiest of pancake lovers! What do you top your pancakes with on Pancake Day? 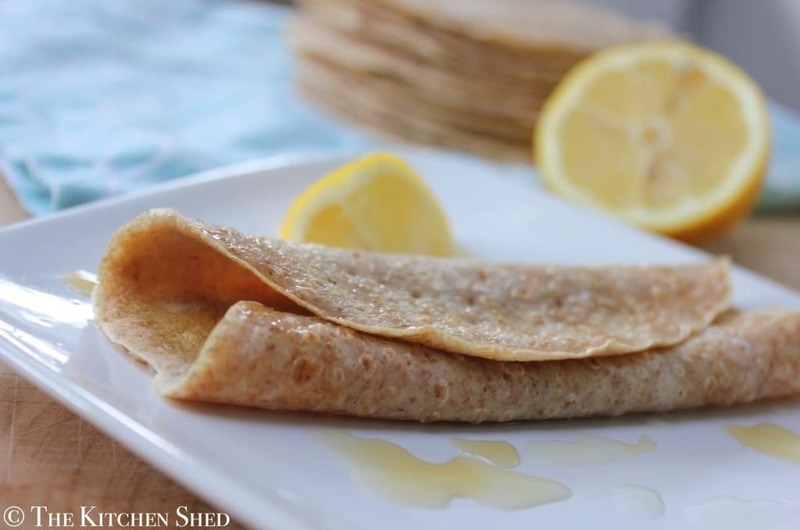 These Clean Eating English Pancakes taste so much like traditional English pancakes (made with white flour) that they would be an easy substitution to make for new Clean Eaters. Place the flour into a large mixing bowl and make a well in the center. Crack the eggs into the well and whilst whisking, add the water and milk. Give it a good hard whisk to make sure the batter is nice and smooth. The mixture will be very thin and watery. (Use the first few pancakes as testers to get the amount of mixture you need to pour exactly right. I used a small, one person size pan and filled it with about 3 Tablespoons of mixture). Whilst pouring the mixture into the pan, swirl it around so that the mixture covers the base of the pan evenly. The first pancake might take longer to cook, but after that in the small frying pan they took 30 seconds on the first side and 20 seconds on the second side. You will know when the pancake is ready to flip when the light mixture turns dark all over the top of the pancake. When this happens, use a spatula to lift up the edges and give the pan a gentle shake to loosen the pancake. Then flip the pancake and cook on the second side until done. Serve with honey and lemon juice, or any other clean eating fruit topping. Had breakfast out today at Fine Foods in Stamford – avocado, chilli & tomato on gluten free toast! I tried making these and gutted as they were a complete disaster . I’m not sure if it’s because I used spelt flour as I couldn’t get plain wholemeal flour but I also found it tricky working with such a thin batter. #feeling deflated.